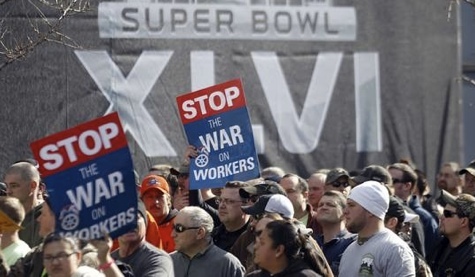 This is a short dispatch from Occupy the Superbowl this weekend in Indianapolis. Detroit, and Chicago rallied with UNITE-HERE in solidarity with Hyatt workers. Workers have been fighting for collective bargaining rights, OSHA compliance, and a living wage with benefits. The $1,000/night room rate for Super Bowl weekend makes blatant the hypocrisy of the Hyatt’s refusal to treat workers fairly, while making millions off of them. NFL Players Association executive director DeMaurice Smith joined us, reassuring us that the NFL would continue its year long Hyatt boycott in solidarity. suspected instances of labor exploitation.